Effects on smoldering speed (propagation velocity) and extinction condition against the pressure at various adopted O2 conditions. Credit: (C) Toyohashi University Of Technology. Toyohashi University of Technology researchers have discovered that non-flaming combustion (smoldering) of a porous specimen can be sustained, even under nearly 1 percent of atmospheric pressure. 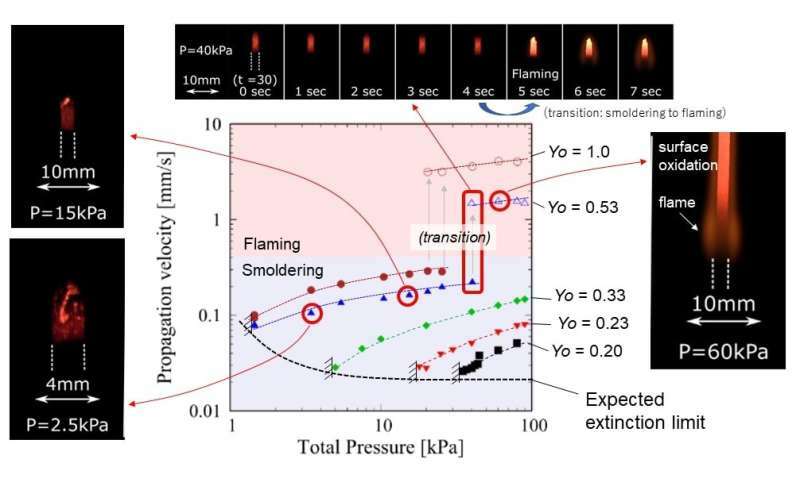 The thermal structure of a 2-mm-diameter burning specimen at very near extinction condition was successfully measured using an embedded ultra-fine thermocouple, clarifying the key issues that lead to fire extinction at low pressures. The outcome of this research will contribute to improved space exploration fire safety strategies. Non-flaming combustion (i.e., smoldering) is an extremely slow-burning process that emits toxic gas and white smoke. This corresponds to the pre-flaming stage of burning a porous specimen, during which the blackened part grows, continuing the slow exothermic process. It eventually generates a flame that quickly accelerates the fire damage. Flaming combustion can be suppressed by reducing the pressure to nearly 1/3 of standard pressure (~30 kPa). Nevertheless, non-flaming combustion can be sustained even at 1/100 of standard pressure (~1 kPa) if the ambient gas is fully-oxygenated. Extension of the critical pressure has been proven experimentally; however, the actual reason is not known because it is extremely difficult to investigate the thermo-chemical status of near-critical conditions. Because the combustion intensity is very weak, sensor insertion may affect the status, resulting in failure to capture the actual physics. A research group led by Professor Yuji Nakamura from the Department of Mechanical Engineering at Toyohashi University of Technology took on the challenge of measuring the temperature distribution of a smoldering thin rod in a pressure-controlled chamber at near-critical conditions. To make this possible, special care was taken to adjust the sensor while avoiding the potential failure described above. A 0.2 mm diameter hole was drilled through the fragile specimen. Then a 50-micron R-type thermocouple was embedded into the hole. By achieving steady-state burning, even near the critical conditions under a well-controlled experimental environment, a repeatable 1-D temperature profile was obtained along the axis. Temperature measurement device: fine thermocouple installed in 0.2-mm diameter hole in the specimen. Credit: (C) Toyohashi University Of Technology. The first author, Takuya Yamazaki, a Ph.D. candidate, said, "No one could even consider drilling such a tiny hole into the 2-mm scale of the fragile specimen that we used, and then manually inserting the tiny thermocouple in it. Of course, no one has tried this before, since it is clearly extremely difficult, and requires considerable patience and effort. In fact, I must admit, it was really exhausting to complete this task. Nevertheless, this provided us insight on the thermal status near the critical condition to thoroughly understand the extinction mechanism. For instance, combustion heat is first transferred along the axis by radiation, then part of the transferred heat is lost to ambient via natural convection when the total pressure is in the order of tens of kilo-pascals. Because the convective heat loss tends to be suppressed when the total pressure decreases, the heat transferred by radiation could remain in the specimen to avoid extinction. This fact has been demonstrated by this work for the first time ever—we are the first group to take on the major challenge of measuring the precise temperature distribution of a smoldering specimen at near extinction." Professor Yuji Nakamura says, "The present results are opened to the fire society simply owing to Takuya's personal devotion. This outcome suggests that the vacuumed operation to extinguish fire in space may fail unless the proper condition is achieved. Otherwise, smoldering would survive, and it would cause the fire to result in secondary damage to the cabin. This work is just the first step to propose a fire safety strategy (regulation) in outer space habitats to privatize space development." Though the word "smoldering" is commonplace, no one knows how a specimen burns to generate heat locally. It has been considered that surface oxidation is the source of heat generation, and that gas-phase reaction is not required. However, recent numerical predictions by a Chinese research team found that a gas-phase gentle heat generation can support or promote surface oxidation. 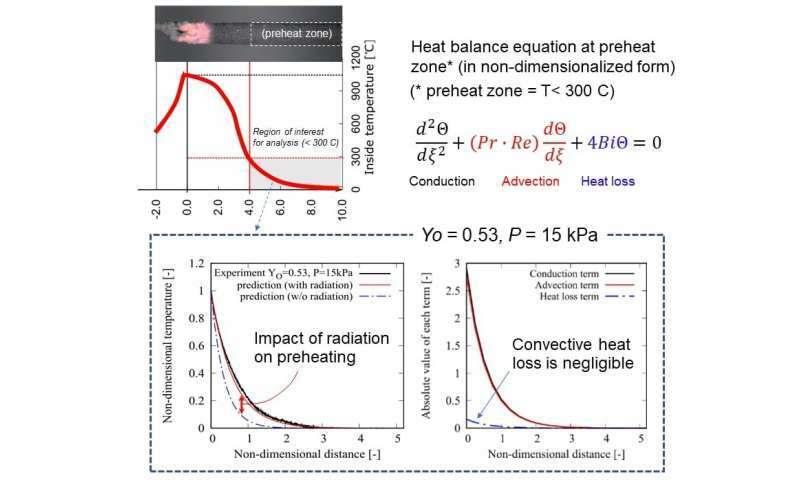 Thermal status during smoldering under low pressure: radiation heat transfer becomes significant, whereas convective cooling (i.e., heat loss) to ambient is negligible in the preheat zone. Credit: (C) Toyohashi University Of Technology. To understand smoldering at low pressure, another international collaboration team in the United States, led by Prof. Nakamura, will assume the challenge of experimentally identifying the reactivity in the gas phase. This is a very important endeavor, because scant attention has been paid to the reaction status of the micro-pores of a burning specimen.